The requirements relating to driving safety, driving comfort, exhaust emissions and fuel economy are becoming ever more stringent. This entails more intensive information exchange between control units. A well-engineered solution is necessary to ensure that the electrics/electronics in the vehicle still remain manageable and do not take up too much space. The CAN data bus is such a solution, It was developed specially for automobiles and is used by Mercedes Benz then other makes like BMW, Volkswagen and Audi. CAN stands for Controller Area Network and means that control units are networked and interchange data. A CAN data bus can be compared to an omnibus, whilst the omnibus transports a large number of persons, the CAN data bus transports a large volume of information. What are the possible options for data transfer in vehicles at present? Option No. 1: Each item of information is exchanged over a separate wire, this is used in traditional communications protocols. CAN Data Bus is a type of data transfer between control units. It links the individual control units to form an integrated system. The more information a control unit has regarding the state of the overall system, the better it can co-ordinate the individual functions. Sometimes the Diagnostic Scanner will not enter the CAN BUS network directly, but via a CAN BUS Gateway. - If the data protocol is extended to include additional information, only software modifications are necessary. - Low error rate through continuous verification of the transmitted information by the control units as well as additional safeguards in the data protocols. - Fewer sensors and signal lines through the multiple use of a sensor signal. - High-speed data transfer is possible between control units, usually standard baud rate is 500,000 bits per seconds while traditional communications protocols ( UART mainly) are from 9600 to 10400 KBPS, which also used to communicate with the diagnostic scan tool via the DLC. - More space available through smaller control units and smaller control unit plugs. - The CAN data bus conforms to international standards (for example ISO15765) and therefore facilitates data interchange between different makes of control unit. 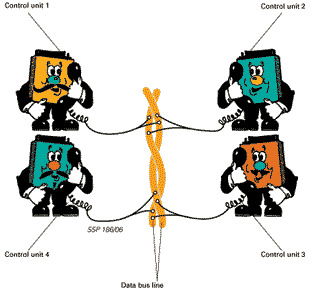 Data transfer with the CAN data bus functions in much the same way as a telephone conference. A subscriber (control unit) ”speaks“ data into the line network while the other subscribers ”listen in“ to this data. Some subscribers will be interested in this data and will utilize it. The other subscribers will choose to ignore this data. The CAN data bus comprises a controller, a transceiver, two data bus terminals and two data bus lines. 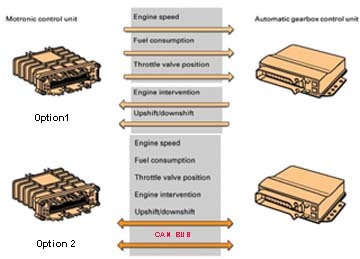 Apart from the data bus lines, the components are located in the control units. The functions of the control units are the same as before. Receives the transfer data from the microcomputer integrated in the control unit. The CAN controller processes this data and relays it to the CAN transceiver. relays it to the microcomputer integrated in the control unit. Is a transmitter and receiver in one. It converts the data which the CAN controller supplies into electrical signals and sends this data over the data bus lines. Likewise, it receives data and converts this data for the CAN controller. Is a resistor. It prevents data sent from being reflected at the ends and returning as an echo. This would corrupt the data. Are bidirectional and transfer the data. They are referred to as CAN High and CAN Low. Supplying the data: The control unit provides data to the CAN controller for transfer. Sending data: The CAN transceiver receives data from the CAN controller, converts it into electrical signals and sends them. Receiving data: All other control units networked with the CAN data bus become receivers. Checking data: The control units check whether they require the data they have received for their functions or not. Accepting data: If the received data is important, it is accepted and processed. If not, it is ignored. AutoHex Diagnostic Scanner adopts all types of CAN BUS protocols. Microtronik offers the basics of the can bus network in the new vehicles, also the communication types with the Diagnostic Scanner. CAN BUS testers can be found only in the scan tools that designed after 2005.